The Residents have kept their identity secret for twenty-eight years. They have no faces, no gender, no race and no personality. This decision was reached because they wanted a separation between their personal and professional lives. Anonymity was and is their only rule. These faceless anti-stars have stood on the fringes of the music world happily releasing their often-disturbing music to critical acclaim. They are supposedly originally from Shreveport, Louisiana, and one is the father of Siamese Twins. Maybe one is a former Protestant Minister and another has one of the largest model railroad collections in the world. Regarded by many to be the original pioneers of the music video, The Residents produced their first video in 1972 (Vileness Fats), but really came into their own when they released Third Reich ‘n Roll in 1977. In this video, the band is dressed entirely in newspapers, as well as the instruments and set. There is crude stop action animation filmed in black and white color that makes the hair on your neck stand up. In 1980, The Residents released The Commercial Album, which consists of 40 one-minute songs. Their company then bought forty one-minute commercial slots on KFRC-AM radio in San Francisco, and broadcast the entire album in bite-sized chunks. Four videos called One Minute Movies, were shot for promotional purposes and were once widely shown on MTV, back when they had music videos on MTV. There literally is not enough room in this article to completely do justice to The Residents career, so here are some milestones: The Third Reich ‘n Roll is part of the permanent collection of the Museum of Modern Art in New York City; In 1979, Britain’s New Musical Express called The Residents album, Eskimo one of the most important recording of all time; Their best selling EP, Duck Stab (1977) is considered a classic of the New Wave era; Their CD-ROM Freak Show (1992) helped define the medium and Bad Day On The Midway (1996) and The Gingerbread Man (1990) remains a classic of the era; Wormwood (1998) deals with the darker and sexier side of the bible using direct passages from the best selling book of all time. Wormwood is the most accessible music that The Residents have ever released. 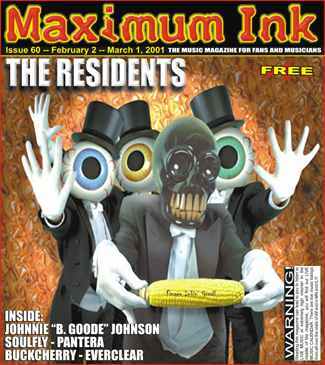 The year 2001, The Residents are still on the forefront. Icky Flix (DVD) finds The Residents taking their videos and putting them on DVD, along with new recordings of their old songs. You can have your choice of the original or new versions of the songs. Twenty years after first seeing Third Reich ‘n Roll, I still get spooked, just like the first time that I saw it. The Residents are currently on a very short and special tour and Madison, Wisconsin is fortunate enough to be included on this 10-city tour. They play the Orpheum Theater on February 22nd. Publisher’s Note: The Residents refused to be interviewed on the count that they have nothing to say about their music.